If I had a story for this, I've forgotten it. I made this months, probably a year, ago. What I can tell you is this is a seaside town. 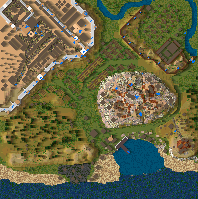 It has a massive hill loaded with resources that the townsfolk mine for a living, and ship to places far away. There are farms nearby, and the farmers live close to their work there. And the "village" is really more of a city - complex and bustling, like many a city. With a barracks and a parade ground for soldiers and guards, a church and a cemetery within the thick walls, and finally the palace has beautiful gardens for the children to play in, and the lord and his wife to rest in, away from the bumbling noise and sweat of life. If I recall correctly, it is also the safest part of the town in the case of a siege. Forgive me if the trees die; I think I overloaded the map with foliage. I vaguely recall fixing it, but then I saw some trees dying. Hopefully I am wrong. Perhaps you can imagine what sort of story a village like this might generate? Is there something wrong with the file, it only says 22 bytes and the file is empty when I open it? I reuploaded it. Sorry bout that.